As a Certified Pharmacy Technician, you can enjoy increased earning power, job flexibility and growth opportunities. 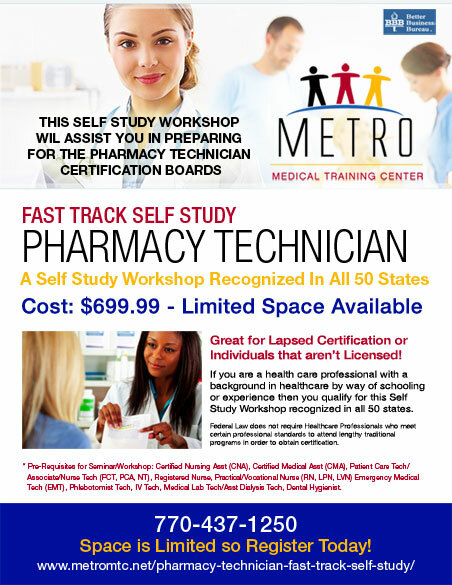 The Pharmacy Technician Certification self study workshop teaches you from the ground up. You work at your own pace. Choose the best… Pharmacy Trainer Self Study workshop. * Pre-Requisites for Fast Track Self Study: Certified Nursing Asst (CNA), Certified Medical Asst (CMA), Patient Care Tech/ Associate/Nurse Tech (PCT, PCA, NT), Registered Nurse, Practical/Vocational Nurse (RN, LPN, LVN) Emergency Medical Tech (EMT), Phlebotomist Tech, IV Tech, Medical Lab Tech/Asst Dialysis Tech, Dental Hygienist! What can I expect from the Pharmacy Technician Certification Guide? You can expect an all-inclusive course that will give you the information you need to pass the PTCB or ExCPT exam on your first try! The materials are written by current pharmacists and professional educators in a unique, easy-to-understand style that will make you feel like you have your own personal tutor. When the course touches on areas that could be hard to understand, it slows down and explains everything in detail to make sure you don’t get lost. Self-study students can learn as fast or as slow as they want, students in a live class have instructors are always helpful and able to answer your questions. Whichever method you choose, the examinations throughout the course will ensure that you are right on track as you progress step by step. How much time will it take for self-study students to complete the course? In general, we recommend a period of six to eight weeks for a student who can study one to two hours per night. We have had students who have completed the course in a much shorter period of time, but we would consider the suggested time period to be optimal. Your work experience and general study abilities will generally dictate how fast you can move through the material. Of course, if you have been out of school for an extended period of time or have a hectic work or family schedule, you could take longer. The main benefit of choosing a self-study route is that you can take as little or as much time as you feel is necessary. I have no pharmacy experience. Is your course still the best for me? Yes! We have helped thousands students with absolutely no pharmacy experience pass the certification examination on their first try! Our course is written so that a student with no experience could be brought into the practice of pharmacy in a well-coordinated and easy-to-understand way. Concepts are explained in depth, and chapters are arranged so that knowledge from one chapter provides a foundation for the next. Students are walked through the process of filling prescription orders in both retail and institutional pharmacies. Pharmacy math is covered step-by-step from the ground up. The legal aspects of dispensing drug products are explained from the beginning of pharmacy legislation. Difficult concepts such as pharmacology and pharmacokinetics area explained using everyday examples and easy-to-understand language. You will never be lost due to assumptions of previous knowledge! I have lots of pharmacy experience. Is your course still the best for me? Yes! You may have plenty of pharmacy experience, but very few candidates have experience in every area that the certification examinations test. Do you have experience in IV Admixture? Are you confident in calculating IV flow rates? How about pediatric dosing? Cart Exchanges? Compounding? Aseptic technique? The list goes on and on. Your experience will surely help you on the material you use daily, but you still need a complete course that can cover all of the knowledge needed from other practice areas. I am math-phobic! Can your course help me? Absolutely! Our coursework recognizes that most students have been out of school for a while, and it may have been some time since the student was in a math class. We start off the process with basic math functions that relate to the practice of pharmacy. The basics of fractions, decimals, and Roman numerals are covered to give a firm foundation to the more complex math calculations to come. As the course progresses, it teaches necessary skills needed to tackle the more complex pharmacy calculations. Even the most math-phobic students will love the PharmacyTrainer approach!